I am partnering up with Land O’Lakes again to bring you this awesome cake. With these incredibly hot summer months upon us in Florida, I have been craving delicious frozen cocktails like crazy. Too bad I have to wait until August to drink one again! Luckily, I finally got a nice break from the heat last week on a fun visit to Minnesota. Land O’Lakes took all of us Kitchen Conversation bloggers out to one of their dairy farms to really see what the day to day life is like on a dairy farm. Sadie Frericks (who also blogs at Dairy Good Life) graciously let all 9 of us come visit her farm for the day and ask her a billion questions. 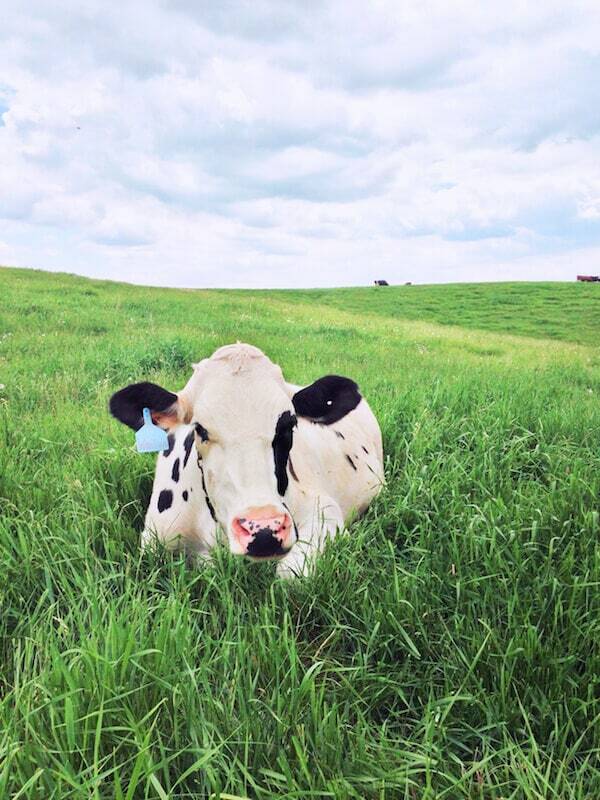 Sadie’s farm has approximately 75 cows and it takes 3 hours for each milking…and they have to be milked twice a day. Whoa. I was so interested in the process, but I was even more interested in meeting all the adorable cows. Each of their cows has a name her and her family have picked out, but as she showed us, they also each have their very own personalities! It was a blast getting to see behind the scenes of where some of Land O’Lakes milk comes from! But let’s get back to what is important…this cake! I just love how the tropical flavors come together in this dessert. The light, moist Bundt® cake makes a perfect dessert for steamy summer nights. Even better, I love how this recipe calls for four perfectly sized Land O Lakes® Butter Half Sticks. It makes measuring so easy—with no leftover portions hanging out in your fridge. Preheat oven to 350°F. 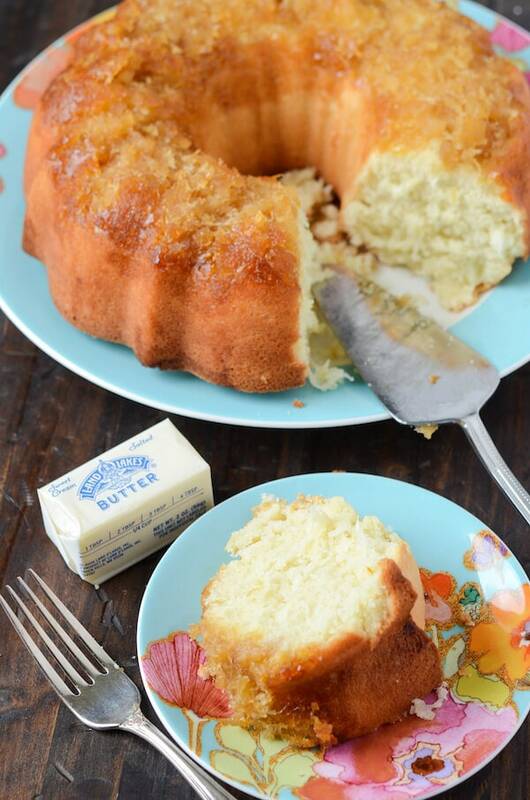 Grease a 12 cup Bundt® pan. In a small bowl, combine pineapple, 2 tablespoons melted Land O Lakes® butter and brown sugar. Evenly spread mixture in the bottom of the Bundt® pan, set aside. In a medium bowl, sift flour, cornstarch, baking powder and salt together. Set aside. In a large bowl, beat butter and sugar until fluffy. Add the eggs one at a time until well mixed. Add vanilla extract and coconut extract. Mix flour mixture into the batter alternating with the coconut milk. Gently fold in shredded coconut. Transfer batter to the prepared Bundt® pan and bake until cooked through and the top is golden brown, about 1 hour and ten minutes. Cool in cake pan for about 15 minutes then invert onto a cake plate. Serve warm or store in an airtight container until ready to serve. The Novice Chef has partnered with Land O’Lakes for an exclusive endorsement of Land O Lakes® Butter for the Kitchen Converstaions blogger program. This blog post is sponsored by Land O’Lakes. Looks like you had a blast! And what a beautiful day. This cake was so good Jessica! I devoured a whole slice 🙂 So fun seeing you in MN!! When I took my first bite of this cake, all I could think about was my mom. I know she’d just love this, and I can’t wait to make it for her! It was great to see you in MN – take care of yourself and your babes, have a great summer! This looks absolutely AMAZING!! I am in love with pineapple and coconut!! Great! I just got some unsweetened coconut milk yesterday! Hope you made it home early! Just wondering what kind of coconut milk you’re referring to: coconut milk (like the Blue Diamond brand that comes in a cardboard box), or do you mean canned coconut milk (like the kind you use in Thai or other Asian recipes)? This cake looks delicious! If I want to make a 13 by 9 cake instead of a Bundt, how long would you recommend baking it, and at what temperature? Ahhwhat a perfect cake .. would love to have a slice for breakfast. Love the use of pineapple and cocnut milk.. it must have been delicious. I’m right there with you on the frozen cocktail thing… or any cocktail, really. I think I just want whatever I can’t have. Except I have to wait until November!! 🙁 I’ll just have to curb the craving with cake. 😉 P.S. That cow. I’m dying over the cuteness. Just like a pina colada! So perfect for summer… and that buttery sweet pineappl-ey goodness caramelized on top?! Looks incredible! Well if you can’t DRINK your cocktails, might as well eat them! 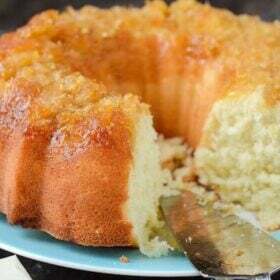 This cake looks so perfectly moist and sounds like a tropical adventure! Did anyone ever find out if the coconut milk is the refrigerated carton milk, or the canned coconut milk used in Thai foods? This cake is a keeper. I will add this to my list of special cakes. Baked this for a co-worker’s birthday and it was a big hit. Do I just grease pan or can I grease and flour pan? I only greased it – but you can also flour it if you would like. When I saw this recipe I was really excited. Went to the store and purchased everything exactly as recipe requested. Both my daughter and I read the directions and followed each step carefully. I am 67 years old, and have been cooking and baking from scratch as well as boxed cakes for years. As they say; there is a first time for everything. My cake did not turn out well at all. It was extremely dense. All I could think of was the amount of money wasted. Does anyone have any thoughts as to what I may have done wrong. Hi Maria, it is a pound cake, so it is a dense cake! If it was TOO dense, possibly check your baking powder to make sure it’s still fresh or make sure you used 1 cup of butter total (2 regular sticks of butter). Is the Shredded coconut used Sweetened or unsweetened? Can this cake be frozen?? I have made this delectable cake, from start to finish this is by far a Master Piece! I was praised by all that got a chance to taste it. And believe me there were Not many! I showed my dad a picture of it and he said, ” When are you going to make ME one of those fancy cakes! I am making him one tomorrow! 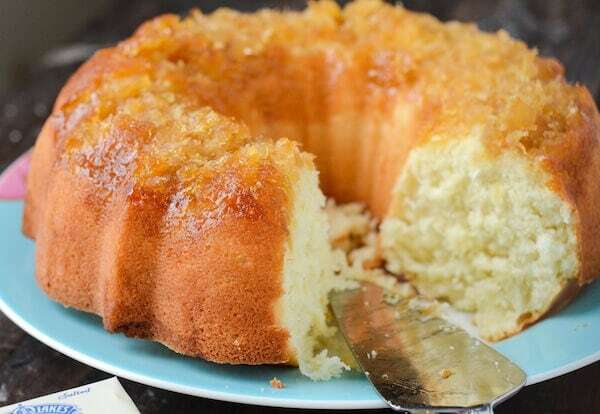 Thanks for sharing this moist and tropical flavored CAKE! OUTSTANDING! What are ‘half sticks’ of butter? Generally sticks are 4 ounces or 1/2 cup each. I have this question too! Is it four half cup sticks, or two? I’m going to put in two since it says 1 cup! Wish me luck! Hello Jessica, I’ve been looking for a coconut/pinapple cake for a long time. I’m grad I came across this one. Thanks for sharing. as Land O’ Lakes. A pound is a pound. This cake was delicious. I made it for my mom’s birthday and everyone loved it. I am no pro at baking and these instructions are super easy to follow. I want to bake this cake before the weekend but I don’t have coconut milk. Can I use regular milk or buttermilk instead? The cake is delicious! Should it be refrigerated? I made it for Thanksgiving. It was wonderfully delicious! I have made this cake multiple times. It just gets better and better! I get rave reviews from my elderly father. Who will NOT even let me have a slice of cake if I tell him that I baked it for him!